“The ‘Pyrokinesis’ video is the visual internalization of a volatile relationship. It’s about not wanting to leave someone even upon the realization that you are no longer good for each other, and the battle between staying and letting go,” budding local pop artist Clairity tells us of her new spot, for her first single as a newly independent artist, which we’re thrilled to exclusively premiere. “The music video’s overall aesthetic was largely inspired by Stephen King’s Carrie and Firestarter. Being a pretty big fan of both films, and of sci-fi in general, I wanted the video to be very visually overt in its commitment to the term pyrokinesis,” the singer explains. Barely 20, Clairity’s career actually began at 15, when she was taken under the wing of local songwriter Pebe Sebert, the mother of pop star Kesha. By 17, she’d signed a major label deal with Lava Records, and released her debut EP, Alienation, while continuing to co-write with renowned artists across the nation. After a string of film and television placements, including an X-Men trailer, tons of internet buzz, playlist spots, and viral success, as well as live performances with the likes of Halsey and DNCE, Clairity recently opted to spilt from her label over creative differences, and has been busy cultivating a new chapter of her career as an independent artist, beginning with “Pyrokinesis. Filmed at a friend and videographer’s family farm in Clarksville, the perfectly paired video captures both the sci-fi notion of pyrokinesis, the psychic ability to control fire, as well as the fiery, emotional volatility of the song’s subject matter. 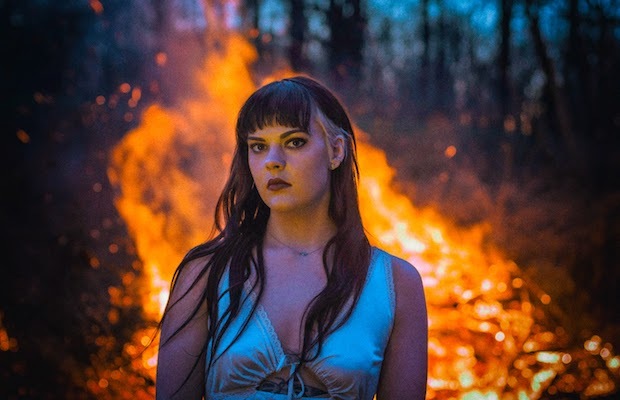 Able to channel an emotional resonance beyond her years, paired with a sort of Lorde meets Lana Del Rey inherent cool and aura of enchantment, Clairity seems destined to become Nashville’s next big breakout pop success, and we’re absolutely hypnotized by her latest video. Watch it below! In addition to “Pyrokinesis,” today also marks another important milestone for Clairity. “Godzilla,” a song she co-wrote with Nathan Chapman and Pebe Sebert when she was only 15, about embarrassment towards bringing her then-boyfriend home to meet her mom, comparing the situation to dating Godzilla, is the closing track on Kesha’s highly-anticipated, just-released comeback album Rainbow, which is available everywhere to stream and purchase now! Claire is a rare, authentic talent that is unafraid of vulnerability and truth. She is the voice for the unheard, the unwanted and unloved. She gives hope and strength to all.